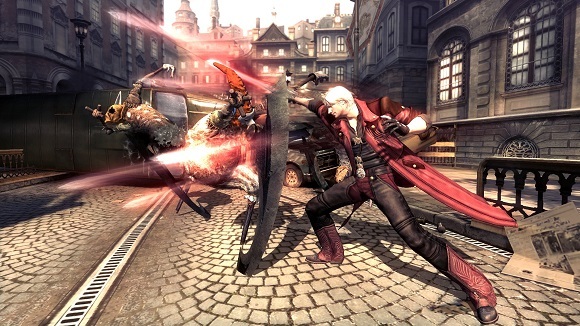 Devil May Cry 4 Special Edition will include all the dynamic action and style introduced in the original 2008 release, which sold more than 3 million units worldwide, plus Legendary Dark Knight Mode, gameplay improvements, and three new playable characters in addition to the previously playable Nero and Dante. With a total of five playable characters, each with completely unique playstyles, this game has the largest roster of playable characters in any Devil May Cry game to date! The bolstered roster will allow gamers to discover many new ways to execute stylish combos in this action-packed game. Devil May Cry 4 tells the story of Nero, a young knight from the Order of the Sword, a mysterious group committed to the extermination of all demons. Nero is tasked with finding Dante, the mysterious assassin who murdered the head of the Order of the Sword. At the same time, more demons begin to appear throughout the city. Nero will soon come to discover the motives behind Dante’s appearance and the truth behind the intentions of the Order of the Sword. Operating System: Windows 7, Windows 8.1 Processor: Intel(R) Core(TM) 2 Duo 2.4GHz, AMD Athlon(TM) X2 2.8 GHz Memory: 2 GB RAM Graphics: NVIDIA(R) GeForce(R) 8800 GTS, AMD Radeon(TM) HD 3850 with 512MB RAM or better DirectX: Version 10 Hard Drive: 27 GB available space Sound Card: DirectSound Support (DirectX® 9.0c) Additional Notes: Some high end integrated graphics and modern gaming laptops with a discrete GPU may work but have not been tested, nor are they officially supported by Capcom. Operating System: Windows 7, Windows 8.1 Processor: Intel(R) Core(TM) i3 3.0GHz, AMD FX-4100 3.6 GHz Memory: 2 GB RAM Graphics: NVIDIA(R) GeForce(R) GTX 570, AMD Radeon(TM) HD 7790 DirectX: Version 10 Hard Drive: 27 GB available space Sound Card: DirectSound Support (DirectX® 9.0c) Additional Notes: Some high end integrated graphics and modern gaming laptops with a discrete GPU may work but have not been tested, nor are they officially supported by Capcom. gan pass nya apa ya? tolong dijawab y yg udh download. gimn ghan carax download ?? ?